Do you know the benefits of yoga to your surf? Yoga, like surfing, is based on discipline, control of the body, perseverance and self-awareness. Doing yoga tunes the subject into their inner-essence, their being, what is beyond their physical form, and it's a lot more than what you imagine. Yoga is a lifestyle. Anyone can enjoy its benefits and it can improve performance in sports. Surfing and yoga come together in Famara, in this course that will improve your quality of life and make you happier and more efficient, agile and flexible. Do yoga and see how much your surfing technique improves. Through Bio Yoga, through the body and yoga moves, you will see small changes in your life that will bring big results. You will be able to connect with your muscles and heart better, and feel your own force and energy. Inspired by Biodescodification, Bio yoga helps to cleanse the body, provides greater vitality and energy and helps improve your health and wellbeing. Hatha Vital Yoga is a combination of Hatha Yoga and Yoga Flow. It helps to calm agitated minds, giving the subject stability. You can improve your breathing and increase your lung capacity. You will stretch all the muscles in your body and feel them better. You can learn basic warm-up activities for doing sports. You will train your interior muscles, strengthening your body structure and revitalising your back muscles to make you feel younger. This is the oldest form of yoga, a sacred Indian discipline that encompasses all aspects of yoga. It is a dynamic, vital from of yoga, working all elements of the human anatomy and capable of completely transforming the body, both internally and externally. You will learn your weaknesses and confront them. You will strengthen your nervous system and learn to respond better to daily stress. You will improve your physical flexibility and agility. The yoga sessions taught by Sandra begin with different postures to warm up the body, especially the joints like ankles, knees and wrists and the tighter parts such as the psoas, the groins, the neck and the shoulders. After the initial Mantra and some "conscious" breaths to be able to tune in with the "Inner Self", the practice alternates the dynamic positions of Ashtanga to the postures to improve the alignment of the body and the opening of the thorax result of Iyengar Yoga. The lesson ends in Savasana, where guided by the mantra sung by Sandra, you sink into a complete relaxation of the body and the mind meets its stillness. "One of the last teachers with whom I was practicing Ashtanga taught me a fundamental concept: in life one must know how to let go, not to cling to anything or anyone, to live here and now. My personal practice of yoga and meditation represents the gasoline to move my internal energy and try to direct it on the correct path to be able to conquer my goals. The mind is everything and having the power to control it is really an intense and important thing, even if the journey is long and difficult. It is a discipline that requires constant perseverance: yoga is for me the primary essence that every day teaches me simplicity, sharing and the need to return to "feeling yourself." Come and share this experience with her! The Thailand massage is a type of Thai massage , which involves stretching and massage deep. This form of bodywork is usually performed on the floor , wearing comfortable clothing that allows movement . Sandra was born in Milan in 1978, after completing her studies in environmental engineering, decided to travel alone, going around the world for a year. In this journey around the world, she developed her knowledge of yoga and Ayurveda massage in India, she certified herself as a Yoga teacher and for more than ten years she has not stopped training and sharing her learning with her students. 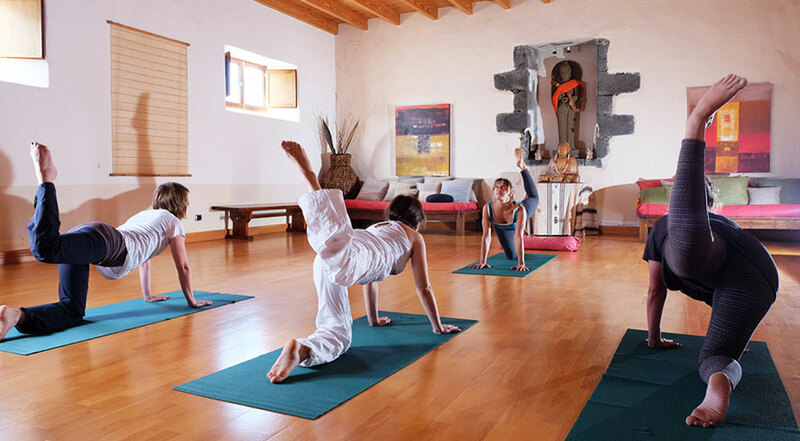 Currently offers yoga and massage classes for students of Calima Surf school in Famara, a magical place for its natural environment. Add programs to your reservation, contact us directly or request a call back. We have added the program to your reservation. All our courses are conducted following the level 3 BSA (British Surfing Association) program So we can guarantee that with the 5 days course you will learn to surf, otherwise you are invited to stay for free as long as it takes until you get it. Do you want to learn surf? This week we have a special offer of -10% for those customers staying at any hotel/apartment in Costa Teguise, Puerto del Carmen, Puerto Calero and Arrecife. We offer hotel pick-up for a minimum of 2 people.